Led Zeppelin, after a two year absence from the stage, scheduled one of the biggest comebacks in the history of of rock. With two massive festival appearances in August, it was meant to give the band the biggest amount of exposure on the biggest stage in the British festival circuit. The importance of these shows is best summed up by author Dave Lewis, who wrote: “For many in attendance it was their first ever concert experience. For many it would be the only time that they would get to see Zeppelin perform live. For that reason alone it holds a special affection in their live history. The first show in particular, with so much riding on it, was perhaps the most important they ever played.” (Led Zeppelin: Celebration II: The ‘Tight But Loose’ Files). Journalist Chris Welch, fifteen years afterwards, observed: “Fans [at Knebworth] were still supporting the band, but there was definitely a feeling [Led Zeppelin’s] days were numbered. Audience reaction at Knebworth had not been overwhelming and many seemed content to stand and stare, like mesmerized spectators at an alien ritual, a far cry from the hysteria of earlier shows. Robert Plant seemed perplexed at the silence between songs, when you could practically hear a pin drop in that vast, cold field. “It wasn’t until he led the way into ‘Stairway to Heaven’ and ‘Trampled Underfoot’ that roars of appreciation began to echo around Knebworth. Robert’s only comment at the end of the last show was a guarded ‘It’s been quite good.’” The soundboard tapes caused a general re-evaluation of the event which was given another boost when much of the August 4th show was used on the official Led Zeppelin DVD. Both shows from the professional source have been in circulation for many years and have seen many worthy releases. Cosmic Energy, on of the pioneer labels for video titles, gives the two Knebworth shows a sterling BluRay transfer. Much like with their work on the Earl’s Court and Page & Plant in Irvine videos, there is noticeable improvement in clarity over other versions. The picture is more sharp and the colors are more rich and vibrant. Cosmic Energy also score high marks for packaging. The carry case come in a brown paper bag (inspired by the In Through The Outdoor marketing campaign) and has many other artifacts such as a miniature reproduction of the program, tickets, button and a poster. It’s one of the best packages Cosmic Energy has ever assembled. One of the highlights of the show is “No Quarter” where Plant introduces John Paul Jones as “the man from Casablanca…some say a man in his own right, other say Royal Orleans” because of his white suit. At eighteen minutes long, Jones plays a tasteful solo on the electric piano recalling the same unified vision of the Earls Court performances capped off by one of the best solos by Page of the evening. “Ten Years Gone” is also tight. This is also the final time it is played live by Led Zeppelin since it will be dropped the following week. There is no editing in the tape after “Stairway To Heaven” so several minutes of chanting and cheering in audible before the encore set. Each of the Copenhagen shows received one, but both Knebworth shows got three. “Rock And Roll” is the first and following which the crowd serenade the band with “You’ll Never Walk Alone.” Plant joins and in twenty years afterwards, in an article in Mojo magazine, Page is quoted saying, “there were tears in the eyes” during that event. “Whole Lotta Love” is played in the same arrangement premiered in the second Copenhagen show and although Page stumbles at bit in the transition from first verse to middle, comes off fine and “Heartbreaker” closes what is one of the most important gigs in Zeppelin’s career. Plant’s assessment is correct. It is a very good and professional performance that hints at their former prowess but their two year layoff is all too apparent. After the opening songs Plant shows his bitterness at being slammed in the press after the first Knebworth show, saying, “Well, it didn’t rain, but it rained on us in the week from one or two sources, and we’re just gonna stick it right where it really belongs.” It is immediately obvious that the emotion and intensity of the first week is lacking. “No Quarter” is fifteen minutes long and includes a masterful duet between Jones and Page in the middle section where there seems to be some telepathy between them proving this is one of the greatest live vehicles written by Led Zeppelin and it is a shame this would be the final live version. Whether the thematic link was intentional or not, but “Kashmir,” “Trampled Underfoot,” “Sick Again” and “Achilles Last Stand” all deal with motion and adventures in foreign lands in one way or another. They are performed well although “Sick Again” seems to puzzle the audience and “Achilles Last Stand” stumbles out of the gate and is generally sloppy. “It’s been great….We’ll see you very soon. Don’t know about the Marquee, but somewhere soon. See you later, bye” are Plant’s parting words. For an historical piece this is a great document to have of this show, warts and all. It’s remarkable how well these shows have aged. Each new release over the years has improved these festival’s reputation, and Mean Business certainly does that. 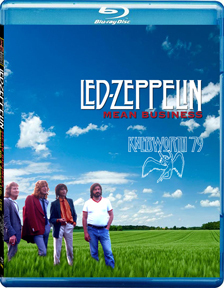 It’s definitely worth the asking price and stands as the new definitive collection for these latter day Zeppelin concerts.